The letter from Dean Jay Ellison to the University of Chicago’s Class of 2020 had its impact felt the second it was reported on. This blog was “one of the first to break the story about the letter to students,” and I am pleased to report an exclusive story about the impact that this letter is having across higher education. My friend Jonah Shrock is a freshman at Brown this upcoming year, and he alerted me to this email as soon as it was sent. Richard Locke, the Provost of Brown University, emailed all Brown students expressing the importance of listening to speakers. Locke also announced that a series of events that are dedicated to Brown’s mission of “discovering, communicating, and preserving knowledge and understanding in a spirit of free inquiry.” Two of the speakers are University of Chicago professors Geoffrey Stone and Martha Nussbaum. 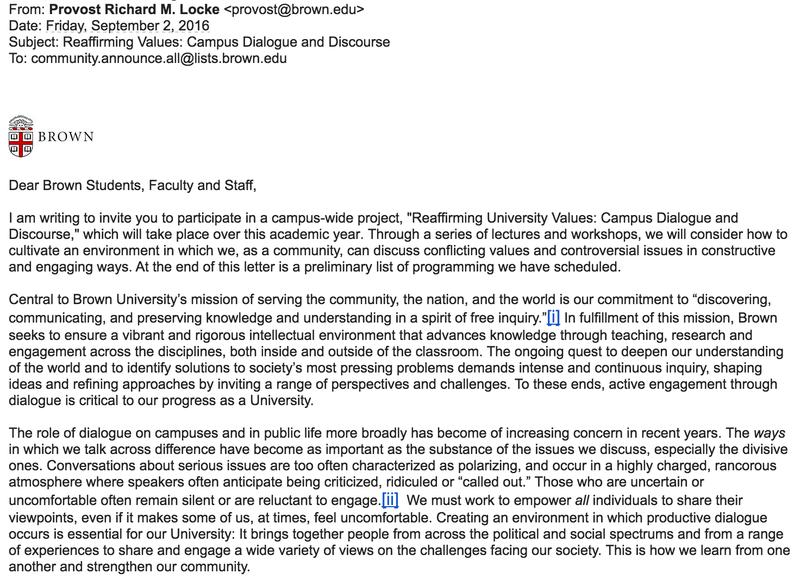 The email further stresses the importance of “productive dialogue,” “active engagement through dialogue,” and “empower[ing] all individuals to share their viewpoints, even if it makes some of us, at times, feel uncomfortable.” The fact that Brown University, which is by no means a conservative institution, sent this email a few days after the Chicago Letter is certainly no coincidence, and is in fact a welcome development. This is a campus where Ray Kelly was booed off stage, where people with views to the right of the Brown student body have to meet in secret, and which was home to one of the most infamous safe spaces in academia that “was equipped with cookies, coloring books, bubbles, Play-Doh, calming music, pillows, blankets and a video of frolicking puppies.” Ironically, one of its professors lambasted UChicago’s “cold, Darwinian” letter to incoming students. I wonder how this professor will react to Brown sending an email with a very similar message. Additionally, 23.2% of Brown students reported being somewhat or very uncomfortable sharing their political views on campus. 17.2% of students identify as somewhat or very conservative, and I am sure that the overlap between the conservative students and those who feel uncomfortable sharing their views on campus is massive. This email suggests that other schools are looking to follow in UChicago’s footsteps. If your school has done something similar, or has taken the opposite route, let me know and I will write about it! I am writing to invite you to participate in a campus-wide project, “Reaffirming University Values: Campus Dialogue and Discourse,” which will take place over this academic year. Through a series of lectures and workshops, we will consider how to cultivate an environment in which we, as a community, can discuss conflicting values and controversial issues in constructive and engaging ways. At the end of this letter is a preliminary list of programming we have scheduled. Central to Brown University’s mission of serving the community, the nation, and the world is our commitment to “discovering, communicating, and preserving knowledge and understanding in a spirit of free inquiry.”[i] In fulfillment of this mission, Brown seeks to ensure a vibrant and rigorous intellectual environment that advances knowledge through teaching, research and engagement across the disciplines, both inside and outside of the classroom. The ongoing quest to deepen our understanding of the world and to identify solutions to society’s most pressing problems demands intense and continuous inquiry, shaping ideas and refining approaches by inviting a range of perspectives and challenges. To these ends, active engagement through dialogue is critical to our progress as a University. The role of dialogue on campuses and in public life more broadly has become of increasing concern in recent years. The ways in which we talk across difference have become as important as the substance of the issues we discuss, especially the divisive ones. Conversations about serious issues are too often characterized as polarizing, and occur in a highly charged, rancorous atmosphere where speakers often anticipate being criticized, ridiculed or “called out.” Those who are uncertain or uncomfortable often remain silent or are reluctant to engage. [ii] We must work to empower all individuals to share their viewpoints, even if it makes some of us, at times, feel uncomfortable. Creating an environment in which productive dialogue occurs is essential for our University: It brings together people from across the political and social spectrums and from a range of experiences to share and engage a wide variety of views on the challenges facing our society. This is how we learn from one another and strengthen our community. Brown has, in the recent past, modeled this deliberate approach to campus dialogue and learning to address difficult issues and promote truth and justice. The important work of the 2003 Steering Committee on Slavery and Justice is an illustration of this approach. In the year ahead, we will again foster an environment of productive, if occasionally uneasy, engagement with various stakeholders whose commitments, values, and identities may conflict, especially around controversial or potentially divisive issues. The “Reaffirming University Values” project, sponsored by the Offices of the President and Provost, will include lectures, panel discussions, and workshops that will draw on the use of dialogue to frame campus conversations, build community, and encourage effective speaking and listening. Our purpose is to foster productive conversation that acknowledges the occasionally conflicting values each member of a community may hold at a given time, allowing each participant to examine and put forward the values underlying their views. At the core of these efforts is a robust recognition of our fundamental commitment, as an institution of higher education, to learning—on the part of students, faculty, and staff. Our success in these endeavors rests on the commitment of members of our community to this approach. At the heart of our University is a scholarly approach that requires us both to challenge others, and be challenged ourselves, in order to promote a deeper and clearer understanding of the complex issues confronting our society. What follows below is a preliminary list of programming we have scheduled. Additional opportunities will be developed in collaboration with other academic departments and centers, and detailed information about the exact times and locations of these events will be shared early in the academic year. I hope you will take part. 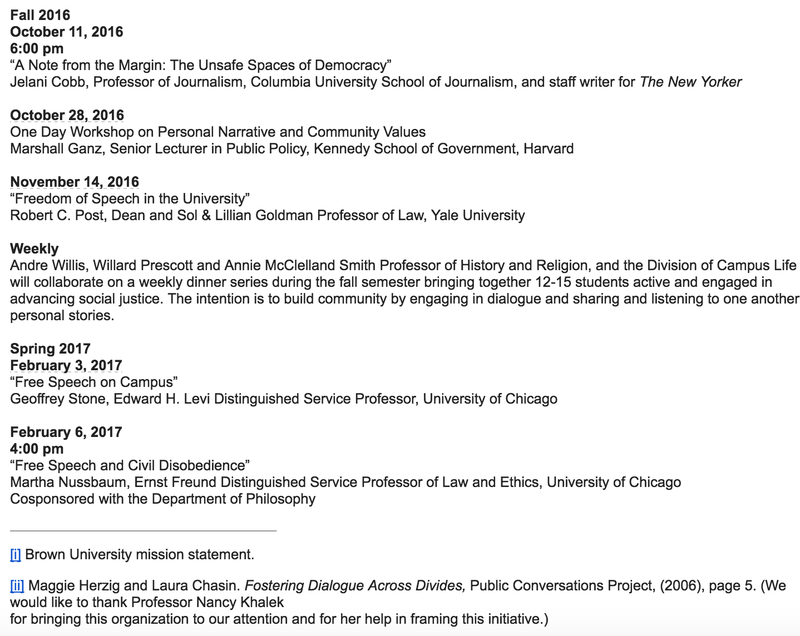 Andre Willis, Willard Prescott and Annie McClelland Smith Professor of History and Religion, and the Division of Campus Life will collaborate on a weekly dinner series during the fall semester bringing together 12-15 students active and engaged in advancing social justice. The intention is to build community by engaging in dialogue and sharing and listening to one another’s personal stories. [i] Brown University mission statement. 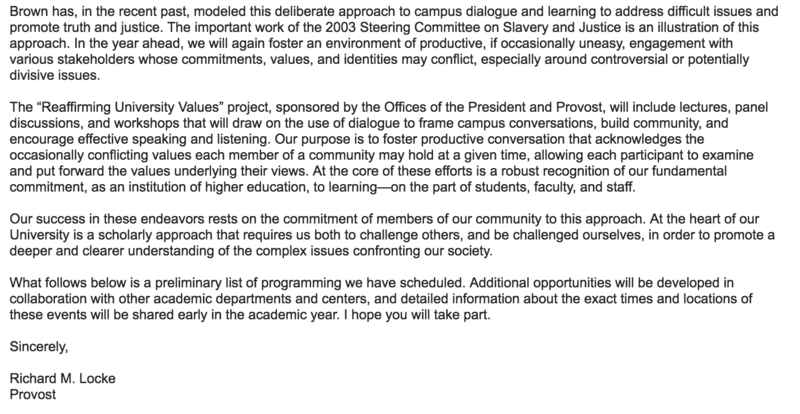 Screenshots of the email from Provost Richard Locke. I admit that I was neither thrilled with Commr Kelly’s speaking fee or his speech being first shouted down, then cancelled. However, the fact remains that if the forum was allowed to occur as formatted, Kelly would have been allowed to espouse his “full-throated” support of the “stop & frisk” theology with minimal opposition points (based on timing slotted for individual rebuttal)! Limitless after speech rebuttals and unbiased reporting in the BDH, BAM & Provo would be vital (but how realistic is that)?